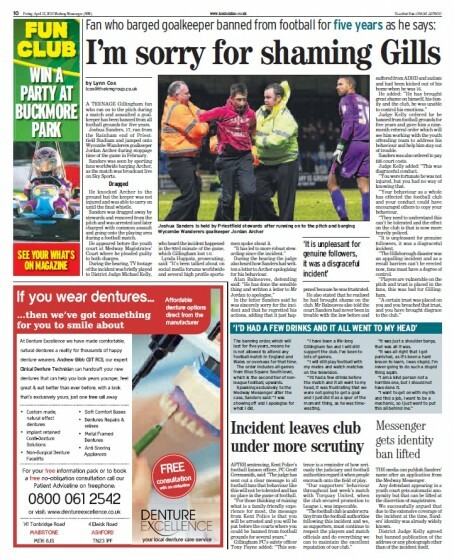 A young football hooligan was named and shamed in his local paper after the crime reporter successfully argued to get the automatic naming ban lifted. 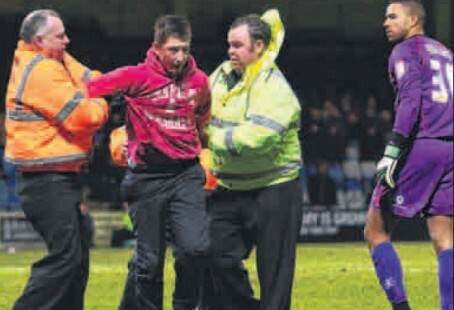 Football fan Joshua Sanders, aged 17, admitted running onto the pitch of the Gillingham vs Wycombe match in February and assaulting the goalkeeper. He appeared in youth court at Medway Magistrates Court – and usually, being under 18, newspapers would automatically be banned from identifying him. But Medway Messenger reporter Lynn Cox persuaded the judge it was in the interests of justice. She told the court that the League One match was screened live on Sky Sports which showed the teenager running from the stand and leaping on goalie Jordan Archer as he prepared to take a goal kick, and described how the incident received worldwide publicity at the time. She also pointed out that his name was extensively published on the internet even by the defendant himself. Sanders’ solicitor Alan Balneaves objected to the application but Judge Michael Kelly agreed his identity could be published, without the address, along with a picture of the incident. Messenger editor Bob Bounds welcomed the result. “It was an excellent result by Lynn. Getting the automatic ban that covers youth court proceedings lifted is notoriously difficult because the courts are highly sensitive where young people are concerned,” he said. The Messenger dedicated a full page to the story, examining a number of different aspects of the court case. Sanders was banned from every football ground for five years and given a nine-month referral order by the magistrates.